Mark Twain’s America | American University Washington D.C.
Melissa Scholes Young's new book delves into how Hannibal, Missouri commemorates its hometown hero, Mark Twain. *Editor’s Note: This month, American University Professorial Lecturer Melissa Scholes Young is publishing her debut novel, FLOOD (see main story). FLOOD is set in her hometown of Hannibal, Missouri, also the boyhood home of Mark Twain. For the occasion, Scholes Young has shared five books that influenced the writing of FLOOD. If you want to learn more about Mark Twain, this could make for wonderful summer reading. Scholes teaches in AU’s Literature Department. Clemens, Clara. My Father, Mark Twain. New York: Harper & Brothers, 1931. I’ve always been interested in how we construct identity. One of the themes I wrestle with in FLOOD is whether the stories we tell ourselves are true. In this book, Clara Clemens tells us about Mark Twain, literary persona vs. Samuel Clemens, the man she knew as father. In her grief, she recounts a magical childhood as the daughter of a great storyteller. Loving, Jerome. Mark Twain: The Adventures of Samuel L. Clemens. Berkeley: The University of California Press, 2010. This book was published on the centennial of Clemens’ death and dives into many of the tragedies of the writer’s life. Loving shows how Twain constantly reinvented himself. Powers, Ron. Mark Twain: A Life. New York: Free Press, 2005. Ron Powers is also from Hannibal, Missouri, so I grew up reading his work. The breadth of his work on Twain is useful, but it’s the warmth and humor in his stories that permeate. I’ll sneak in a recommendation for White Town Drowsing (Penguin Books) for its tales of Hannibal. Fishkin, Shelley Fisher. Was Huck Black? Mark Twain and African American Voices. New York: Oxford University Press, 1993. I’ve always loved Adventures of Huckleberry Finn more than The Adventures of Tom Sawyer because of its depth and controversy. G. Faye Dant, founder of Jim’s Journey, embraces Twain for his humanitarianism, and she first introduced me to Fishkin’s work. The complicated truth Twain tried to write comes not just from Tom and Becky, but Huck and Jim. In the introduction of another of Shelley Fisher Fishkin’s books, Writing America: Literary Landmarks from Walden Pond to Wounded Knee, she writes, “In Hannibal, as in many places in the country, slavery and segregation may be gone, but the persistence of the racism that allowed both to flourish still makes presenting these chapters of the past challenging and difficult. It strikes many as simpler—and safer—just to forget the whole thing. Hannibal is far from alone in sidestepping painful parts of its past.” To me, literature begins conversations sometimes before we are ready as a culture to have them. Hoffman, Andrew. 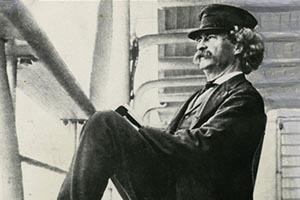 Inventing Mark Twain: The Lives of Samuel Langhorne Clemens. New York: William Morrow, 1997. I love stories with complicated characters, and the alter ego Clemens self-created as Mark Twain is fascinating. In this biography, Hoffman examines the many contradictions that are nonetheless entertaining.